If you don’t like the music on the radio, start a band. If you don’t like the way existing publications are defining your profession, start a magazine. A List Apart hasn’t always been a magazine, but it has always been an attempt to fill a gap in the web design and development conversation. We started as a mailing list (kids, ask your parents). Brian Platz and I designed the A List Apart mailing list differently. Platz and I took turns moderating. Each day, members submitted posts to us. In the afternoon, that day’s moderator would read all submitted posts, detect emerging themes and contrasts, and combine the best submissions into an edited e-mail magazine that was sent to all subscribers that night. In this way, we were able to combine the insights and vigor of a community-written publication with the crisp focus (and freedom from flames) of an edited magazine. Within a month, our mailing list had 16,000 subscribers. Within six months, we were blissfully exhausted—and broke. A web magazine was the natural next step. Why a magazine? Because we didn’t hear the music we wanted on the radio. Hotwired’s Webmonkey and David Siegel’s High Five were, respectively, the reigning commercial web development and design magazines. Both were excellent, but neither focused on the needs of the hybrid designer who cares about content as well as code, usability as well as design. I was a hybrid. Our mailing list’s readers were hybrids. The future of web design lay with hybrids, I thought. The magazine’s longevity and success would prove that theory. 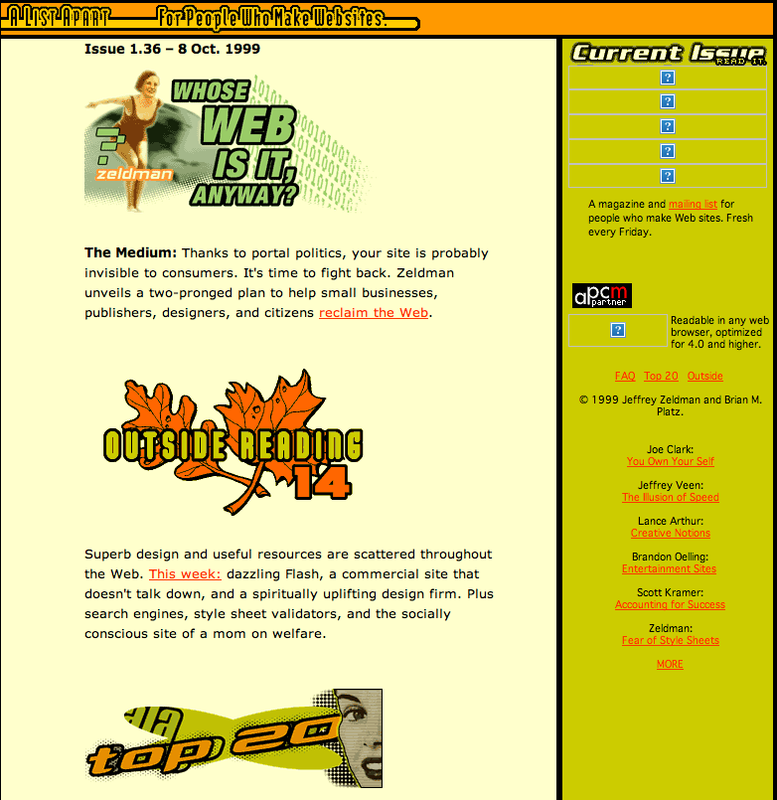 A List Apart , the magazine “for people who make websites,” launched in late 1998 and immediately staked out the high ground thanks to wonderful writers like Lance Arthur, Steven Champeon, Joe Clark, Glenn Davis, Christopher Schmitt, and Jeff Veen, who contributed to our earliest issues. The likes of John Allsopp, Dean Allen, Curt Cloninger, J. David Eisenberg, and Erika Meyer followed, with Douglas Bowman, Dan Cederholm, Aaron Gustafson, and Eric Meyer succeeding them. From Issue 1 (curiously labeled Issue 1.01 because I thought it sounded more “digital” or wired or something) to the present, ALA has been a place where great writers are discovered and where great thinkers share their most important ideas. Today’s ALA author is tomorrow’s important book author and conference speaker. Behold! Talent is grand, but focused talent is grander. For most of our first decade, ALA has been the leading journal of standards-based design, introducing foundational concepts and advanced techniques that were initially mocked, feared, and hated, but are now part of every good web designer’s repertoire. We’ve also worked to advance our profession and help the world understand it. And we launched a conference. See ALA producer Erin Lynch’s The ALA Primer: A Guide for New Readers for more historic highlights that still hold up; browse Topics to learn what else we’ve been up to these past ten years; and for dessert, visit zeldman.com to read about how A List Apart is changing. Otto Leuning is a father of electronic music. As with electronica, so with the web. Good web content takes talent and process. Some among us believe that “content is free” because “the users can now create the content.” These people fail to realize that the web’s “users” have always been able to create content. More importantly, they miss the distinction between stuff and content. Unmediated content is stuff. It does not create the same value and cannot offer the same experience as great content, well edited. Here is where I thank Erin Kissane, our editor for eight years (and now a contributing editor) and Krista Stevens, Erin’s most worthy successor (and before that, acquisitions editor, a role now ably helmed by the talented Carolyn Wood). Our editors can polish rusted flea market finds into genie-spouting magic lamps. When the writing is good (which it almost always is), they make it even better. As you’ve rightly guessed, most articles get rejected, but the great ones make it through—and that’s the point. When the technical revisions finally cease, editorial kicks back in. Erin Lynch and Andrew Fernandez do whatever it takes to deliver the article to your screen, with every kooky code demo and last-minute editorial nit-pick intact. Jason Santa Maria, who redesigned the magazine in 2005, art-directs every issue, and Kevin Cornell illustrates. These people are magnificent, and they work their hearts out. Here is where I thank the brilliant people who built our publishing systems before finding fortune (not from us). 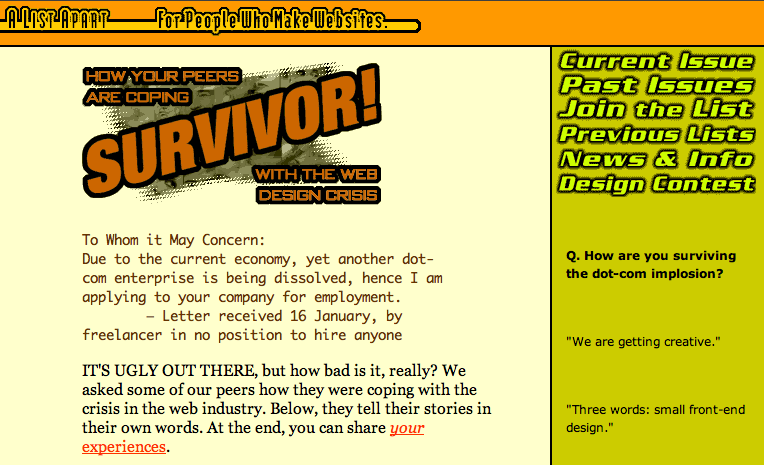 Glenn Davis’s Project Cool hosted the site back when it was a mess of hand-coded HTML (mine), installing ALA as a founding partner in what may have been the first network for web designers. High Five, edited by Christopher Schmitt, was a partner as well. We rocked the 1990s. Bruce Livingstone’s Webcore Labs built the first ALA CMS and also hosted the site after Glenn sold Project Cool. Soon afterwards, Bruce sold iStockphoto. Bling bling! Brian Alvey built and hosted ALA 3.0 before going on to build and sell Weblogs, Inc. Mazel tov! Dan Benjamin (also an important ALA author) built ALA 4.0, one of the first Ruby on Rails applications, and later sold Cork’d. Cheers! These people were and are terrific. Without them, we wouldn’t be celebrating ten years of ALA. Check the About page’s middle column to learn about important contributions over the years by Nick Finck, Webchick, Waferbaby, Todd Fahrner, Tantek Çelik, Tanya Rabourn, Fred Gates, Kylie Gusset, Kirk Franklin, David Whalen, Henry Li, Russell Heimlich, Damon Clinkscales, David F. Miller, and the amazing J. David Eisenberg. Our first ten years were about finding a voice, an audience, and a cause worth fighting for. Please join us for what comes next. Although as a relatively recent reader, I don’t remember ALA when it were knee-height to a grasshopper, I hope that in another decade I can congratulate you all again. For now, well done on creating a wonderful, useful, and entertaining publication. A lot of people appreciate it! A massive congratulations to everyone at ALA, you have certainly changed the way I (and many others, i’m sure) think about the web. You folks have defined excellence in web development—we’d be lost without your superior, game-changing content. Here’s to ten more years! Cheers to you. When I took my first web job in 1999, ALA already seemed like it had been around forever — a testament to the excellent content and great community it had even back then. Keep up the excellent work! Congrats. Keep on keepin’ on. Ten years is a century in the online world. You guys have helped me on a consistent basis with your exemplary work. Thanks and keep it up! However, from the time I have spent here, I’d like to thank you for providing such high quality articles that speak in the tongue of true professionals who really know what they’re talking about and do so with such raw passion. And the fact that the service your provide is free, well shucks that’s just swell! I owe you guys, perhaps I’ll buy you all a beer sometime when I finally save up to attend AEA! I look forward to the next 10 years. I remember first being introduced to ALA six or seven years ago, it’s always been a great reference and a good place to get a brain workout. …and I hope to continue reading for many more. Hooray for ALA! Congrats on the 10 years guys! Gosh, ‘Fear of Style Sheets’ was one of the really nice articles last time 🙂 Congrats and thanks! ALA has been definitely a very valuable resource for all web pros and enthusiasts. The articles are top notch with examples that are ready to use. I look forward to another 10 years, to a new web and a whole lot fun! Although I haven’t been following for the whole 10 years, ALA is the only publication in the world from which I’ve read every single article… I think. A standard of quality that all publications should aspire to. Thank you for your hard work and contributions to the design/development community, I have benefited immensely from the articles. Continue to stay a step above the rest. Happy Birthday ALA. Thank you to everyone that has contributed for making the Web a better place. I’ve been reading ALA for as long as I can remember, and it just gets better and better. 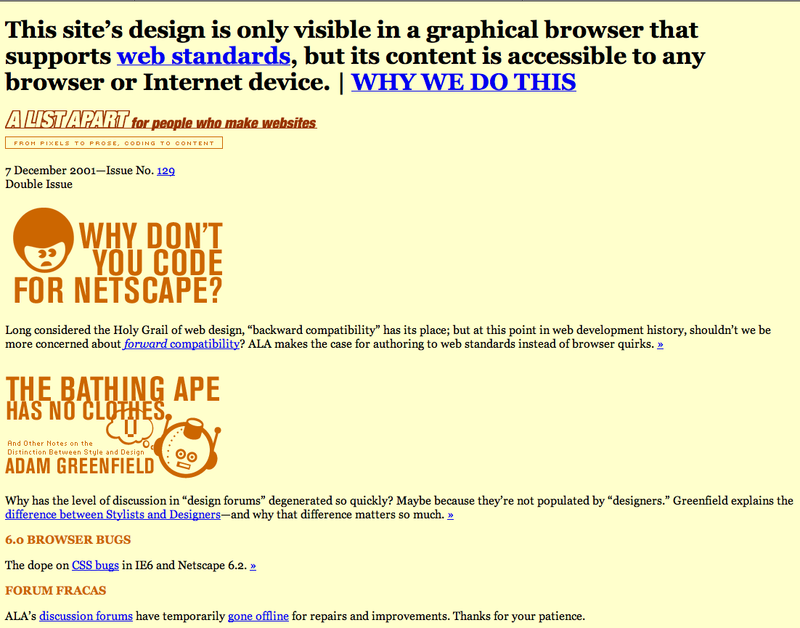 I was fortunate to find ALA when I first got into web design in 1998. It has been a most valuable resource and I thank you for that! Here is to another 10 (at least) years of being a leading in the advancement of the web. You teach me to say goodbye to table layouts. I’ve been following ALA since I started in web design and alongside a multitude of great books, ALA has provided an invlauable reference. We are lucky to have this year won the McFarlane Prize for our efforts at best practice and we credit this in no small way to the authors and contributors along the way who not only showed us the way but showed us that it was right and good! I learn a LOT of stuff from ALA, learning, reading and practicing articles about standards and best practices improves my work quality as Front-end Developer greatly. Thank you very much and Happy birthday. Your high quality is showing this medium the respect it deserve. Ah, the good old days. I was on the old list. It was a real buzz getting your message on there. Happy days. This could be a good answer that classic meme, “You know you’re old when… You were on the ALA mailing list”. Thanks for all of your hard work over the years. I still cite ALA as being my favourite website of all time. It is the very embodiment of style and content. Long may it reign. I must say that A List Apart has been invaluable throughout my career, ranging from being the webmaster of my middle school all the way up to being a full-time Ruby on Rails developer today! OK, I think I didn’t start reading until high school, but you get the point. Also, a tiny typo fix: The name is Damon Clinkscales, not Damon Clinksales. bq. The name is Damon Clinkscales, not Damon Clinksales. Yike! Fixed. Thanks, Grant. Sorry, Damon. And thanks, everyone, for the kind words. Congratulations to everyone who made ALA a reality this last decade. I’ve been following the website ever since I started on my road towards web design back in 2003 and it’s been probably the best resource I’ve ever came across. I’m not the first and I won’t be the last to congratulate you & the ALA team here. The ALA site is a beacon of fine, fine writing and laser guided design in a crowded mass of blessays and podgrams (thank you “Stephen Fry”:http://www.stephenfry.com). Now, having said that… WHAT’S NEXT? I would like to see you guys reaching out beyond the web-addicted community that clearly frequents these regions. How about touching some of those business leaders that are still – unwittingly – yet to fully digest the concept of Cluetrain almost 10 years down the track? Here’s to the next 10. I watch and wait with anticipation. Congrats and thanks to all the authors for the interesting articles. Congratulations, guys, and here’s to another ten glorious years. I’m a recent reader, and I owe you so much! Thanks. Great statement about HYBRIDS! Over the past 8 years ALA has been a constant source of information and inspiration whether it be standards, accessibility, IA, design et al. I just wanted to say thank you to everyone involved who has shared their experiences and knowledge. Congratulations, and thank you so much for creating this site. May you continue to teach and to inspire great web development and design for years to come. ALA used to be my no.1 place since around 2000 when it came to everything new and actually usable within website design. Now, with a bit of sadness, i find that i visit this site less and less often because many articles just aren’t that good or inventive any more. Either the articles don’t live in the real world at all or they seem to have been written with the complete newbie in mind OR they actually seem to be written by a newbie in the business that just doesn’t have the skill that we have been used to see here at ALA. Yes – some of the business practices etc. are great and do take some actual skill to both acknowledge and circumvent, but that is only the non-website fluff. It seems ALA has became “FOR PEOPLE THAT WANT TO LEARN THE WEBSITE DESIGN BUSINESS” instead of “FOR PEOPLE WHO MAKE WEBSITES”. Bring back the old style. The style that set you APART from every other web site about web design out there. The style that made this a website that always was recommended when asked – the style that youÂ´ve gotten famous for. Hearty Congratulations to all at ALA. I have been a regular reader since quite some time now. Kudos to your mission of enlightening people on the web about the web! ALA used to have a great forum. I found it very useful. Then one day it closed. A message informed visitors that it was being remade by waferbaby. I waited and waited. But it never returned. That’s the only sad memory I have of ALA. I wonder what happened. That’s so long ago! I don’t remember the exact sequence. We had a forum by Evolvs and a forum by Waferbaby. There may have been issues with a migration. Or possibly the forum was lost during the two years that alistapart was temporarily housed at alistapart.zeldman.com due to a mistake by Network Solutions and a grab by a company I won’t name. I remember the forum working well during the time that Webchick very kindly list mom’d it. She was great (and “still is”:http://webchick.org/). I don’t remember precisely why or how the forum broke or when and why we came to the decision that it was better not to resurrect it. Sorry you miss it! Thanks for all your work over the years, and thanks for reading ALA. 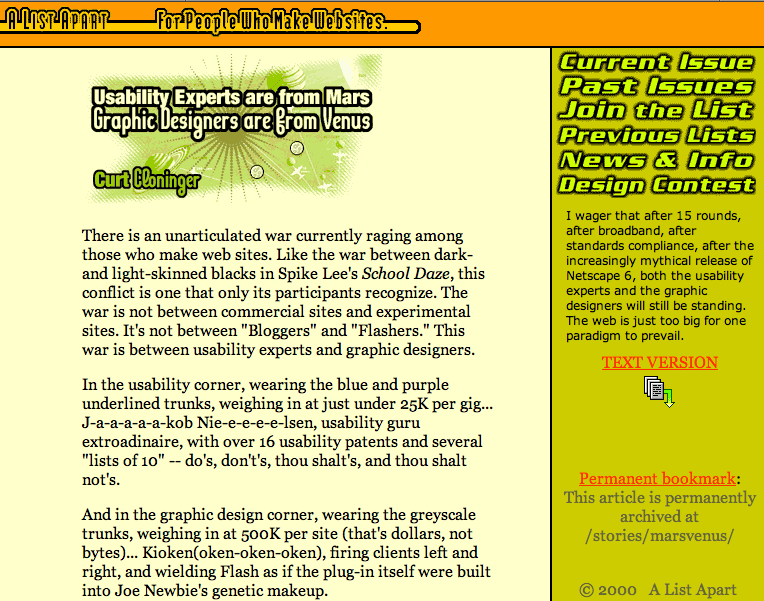 When I took my first web design and seo job in 2000, ALA already seemed like it had been around forever—a testament to the excellent content and great community it had even back then. Keep up the excellent work! Congrats! What’s surprises me is how long I’ve been hanging around here! Can’t wait for the next ten years. Thanks again for everything that ALA has done over the past 10 years! Knowing that much of your information has been a resource for developers, as a “strategery” person, it has been most helpful in qualifying the importance of approaching projects from the right perspective and how other disciplines relate and can learn from the development path. Wow, ten years is not a long time and how many changes that amaze me. I wonder how about ALA site in the next ten years.